Blanch spinach in boiling water for only 1 minute, rinse with cold water and squeeze dry. Mix together soy sauce, sesame oil, garlic, scallion, brown sugar/ Normal sugar and vinegar. 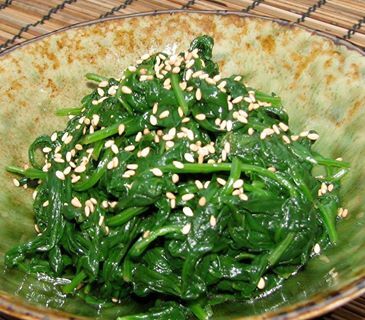 Toss with cooked spinach. Sprinkle with sesame seeds. This entry was posted in Food and tagged cooking, food, recipe, salad, spinach by Miss P. Bookmark the permalink.